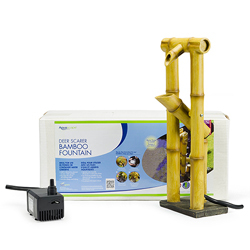 Ideal for use with the Aquascape Patio Pond, the Deer Scarer creates the gentle noise of falling water, replicating a historic design displayed in Japanese gardens. Made from high-quality poly-resin, the fountain is lightweight, easy to install, and resistant to UV and heat exposure. The Poly-Resin bamboo encapsulates the texture, shape, and finish of real bamboo. The feature comes complete with the Aquascape 90 GPH Water Pump for quick and simple installation, taking the guesswork out of selecting the correct pump for your fountain.